Posted on May 11, 2014	by Cat Q.
Manu’a High School’s Samoan Day celebration was held Friday morning in the school’s gym. Samoan Day is typically the culminating event of each school year. It is a celebration of Samoan customs and traditions. Each class is given the task of creating its own song and dance performance, traditional speech, and traditional costumes. The weeks/months leading up to these events are always exhausting. Each class (and its advisers) practices every day (during lunch or after school) for a few weeks. There are endless class meetings, frustrating complaint-filled practices, and near-constant changes to the performances that leave the advisers several shades of frazzled and defeated. Until, of course, that very last practice. The last day of practice is kind of magical. It’s the day the students work the hardest and care the most about getting everything just right–a teacher’s dream, really. Putting everything off until the last minute is a specialty of the class I advise (c/o 2015). They didn’t even start actually practicing during practice times until about two weeks before the event. (One of the mothers told me she spent four hours working on the traditional costume the night before Samoan Day. I’m pretty sure the senior class made theirs the morning of the event.) So, maybe you can understand how it’s so easy for a pragmatic, uptight American like myself to feel a little so totally over Samoan Day from day one. It’s too much on my poor nerves. On the morning of the event, I was so nervous/excited that I woke up at 5am. I got up, finished some work for next week, and waited patiently for the Beard to get out of bed so we could go. We were fortunate enough to catch a ride to school around 6:30. The sunrise was stunning and there was a beautiful rainbow over Ofu-Olosega. The Beard snapped this picture on top of the mountain. Samoan Day didn’t officially start until 9, so we spent the morning wandering around taking photos of the kids. After the guests (staff, parents, and community members) were served some traditional breakfast items (coconut rice, rice and Samoan cocoa, papaya soup, etc), we had a “parade” from the office to the gym. Getting ready to dance our way in to the gym. After an introduction and prayer, the classes performed one by one. At the end of each dance, the Mr. & Miss from each class danced the taualuga (the final dance). Palagi advisers for each class were also asked to dance along-side their class’ Mr & Miss. I have great video of this but the connection here is far too slow to handle an upload. Three respected men (all matai, of course) from the community acted as judges for the event. I’m not entirely sure what the categories where (since all of the information was in Samoan), but in the end the senior class came in first place, followed by the freshman, then junior, then sophomore classes. Here are some more photos from Samoan Day! 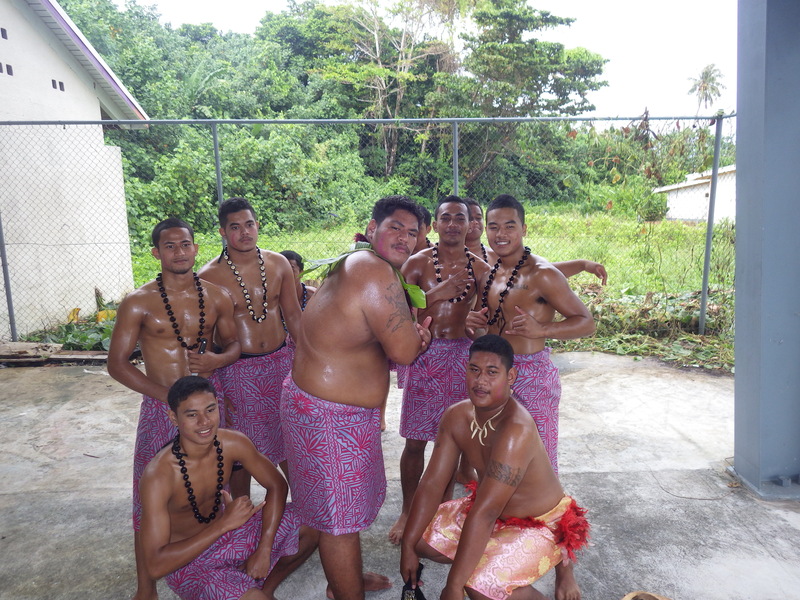 This entry was posted in American Samoa and tagged culture, manu'a, Samoan day, Sega'ula, worldteach. Bookmark the permalink.